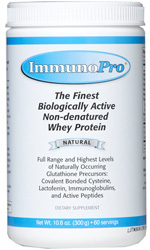 ImmunoPro® Rx is the finest, biologically active, non-denatured whey protein powder on the market. The most potent and the purest whey protein available anywhere. It has the highest level of naturally occurring glutathione precursors, covalent bonded cysteine, lactoferrin, immunoglobulins, and active peptides. Each serving contains 645 mg of Immunoglobulins, and 170 mg of Lactoferrins. Safe for MSG sensitive individuals. The full range of nutritional native proteins in Immuno Pro® Rx assist in the following: antioxidant production (glutathione precursors), complete amino acid supplementation, healthy immune function, and normal cellular function. Lactoferrin - 170 milligrams per 5 grams. An iron-binding, iron-modulating protein that enhances iron absorption when needed. Immunoglobulins - 645 milligrams per 5 grams. Contains numerous immune system benefits. Bovine Serum Albumin – Along with Lactoferrin and Immunoglobulins contains generous amounts of Cysteine and Glutamine, precursors in Glutathione (GSH) production. Active Peptides (specialized paired amino acids), exhibit a beneficial information transfer factor effect as well as promoting intracellular glutathione. Both are important for supporting healthy immunity. Growth Factors (growth promoting protein fractions) are contained within the protein bound fats. Their function is to encourage natural cellular regeneration and help maintain normal blood sugar levels. The whey is derived from disease-free cows that graze on pesticide-free, chemical-free, natural grass pastures. It is hormone treatment-free and GMO-free. Immuno Pro® Rx is not a by-product of cheese manufacture. Used worldwide by the top healthcare professionals since 2000. "I just wanted to let you know how much I love the ImmunoPro® whey protein powder. My body is really craving it and it's amazing how well I feel on it. ImmunoPro® is something my body has been waiting for for a long time, but didn't realize existed. Thanks so much for all your help." Ingredients: Proprietary Native Whey Protein Concentrate - Nothing else! Suggested Use: Shake, stir or lightly blend one or more scoops into water, milk or dairy substitute. Consume 1 or more times daily, preferably on an empty stomach. Wait 15 minutes before eating. Drinking slowly is recommended. The initial uptake of the native protein peptides is in the mouth. You may also place 1/2 tsp. or more of powder in mouth and chew anytime.